Ok, so that is not the official title of the book, but is does seem like people like to complain about everything ultimately blaming it all on God. “God is Not Fair and Other Reasons for Gratitude” by Daniel P. Horan, OFM, are a grouping of reflections about what it really means to follow Christ and how that it often counterintuitive to modern thinking and living. Dan Horan is a Franciscan friar who is an award-winning author, columnist, and theologian, who in his spare time leads retreats and lectures. He is also an assistant professor at the Catholic Theological Union at Chicago. Too often this phrase has become overly spiritualized. It is perhaps too easy, too quick and neat to read this line symbolically as a reference to the waters of eternal life. There is a temptation here for us to ignore the real and powerful human suffering that comes with someone dying of dehydration and experiencing real, life-ending thirst. To overspiritualize the Gospel and overlook the real suffering of human being is a problem because the waters of eternal life mean little for those who die waiting for the waters of basic earthly life. Just to imagining the real thirst, not just the spiritual thirst, that Jesus suffered that day really helped me to understand the world’s need for clean drinking water which pours at the flick of a wrist through our American pipes. quite taken to heart the lessons as Catholic Christians. We hear them with our ears, but don’t live what they say. One of my favorite reflections in this section is the one titled, “When Prayer Becomes About Us.” Frier Horan discusses the parable in Luke 18, where the Pharisee sees the tax collector praying and his prayers to God are more about how more holy and “worthy” he is of God’s blessings over this sad tax collector begging for mercy and forgiveness. When we hear this parable, we often will laugh at the Pharisee and how blind he is, but don’t we do the same thing when we judge ourselves better than someone else? “The judgment we may cast on our family members, neighbors, friends, or coworkers; the condescending remark we may make in response to a suggestion from another; the self-satisfaction that may come with a sense of personal or spiritual superiority when we compare ourselves with others.” (nope, not me, I’ve never done that – NOT). He goes on to explain when we do that, we are making God into someone we think He should be or how we feel that God should judge that person, which is entirely self-serving. That is not the God we have, nor the God we would even want. God wants us humble, honest and truthful. We are all sinners, therefore we need to go to God just as much as any criminal, family member, friend or enemy needs to go to God. Do not judge yourself against another who is sincerely seeking God. What a lesson! Happiness is fleeting; it’s ephemeral. It’s a feeling and emotion that at its core is certainly good, or at least neutral, like all human feelings-and like the full range of human emotions, happiness comes and goes. And that’s OK. However, we’re often told, even by religious leaders, that happiness is what we should strive after in making life choices. Instead, Jesus desires for us not to be happy but to have joy, and to have it completly. 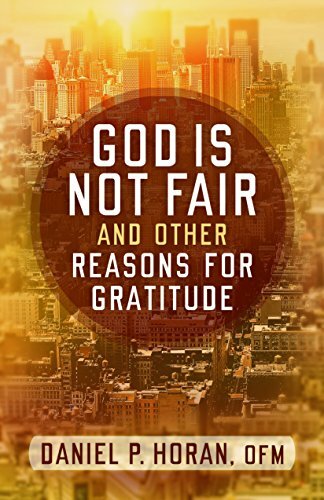 When you have time to just read a page or two of text, and really want to get a life lesson from what you read, “God is Not Fair and Other Reasons for Gratitude” by Friar Daniel P. Horan is the perfect book to pick up. I was able to quickly read a passage or two during school pick-up or before bed, and it was a great reminder of life lessons and new perspectives on the everyday. Author, Franciscan friar, and popular retreat leader Dan Horan puts Christian dilemmas into a new light in this new book of thoughtful reflections. As Paul made clear to the Corinthians two thousand years ago, being a Christian can mean appearing out-of-step at times. This is because a Christian’s priorities aren’t measured by the culture, but according to the reign of God that Jesus preached and modeled. In this collection of essays, Horan demonstrates that the Christian life is most often focused on the counterintuitive and gratuitous foolishness of God’s love revealed in the healing of the broken and brokenhearted, forgiving the unforgivable, and loving the unlovable. Like Jesus’s early followers, the ethical implications of Jesus’s words and deeds for those of us who would follow him are not always what’s expected of us. But the risk of appearing foolish never stopped “God’s Fool,” St. Francis of Assisi, from embracing the Gospel as best he could, protesting the injustices of certain social systems, and letting nothing get in the way of his relationship with others. God Is Not Fair, and Other Reasons for Gratitude addresses what it means to follow Christ in the modern world, opens up the Gospels to explore what Jesus has to say to our situations and predicaments, and delves into what it means to faithfully live by vows—counterculturally—today. Book Review, Catholic Upgrade, Faith, God, mercy. Bookmark.